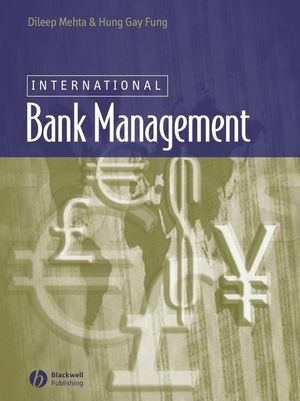 This text provides current and integrated coverage of the important topics in international banking, including foreign exchange markets, derivatives, country risk analysis, asset-liability management, and banking strategies. In order to incorporate the central elements of this field, the text builds on a three-faceted foundation of risk-return tradeoff, the special barriers encountered in international business, and the unique features of banking business. By responding to the increasing globalization of financial markets, this text offers readers the comprehensive, international background they need to prepare for a successful career in banking. Provides current and integrated coverage of international bank management. Incorporates analytical frameworks and real-world examples of key decision-making processes. Includes learning objectives and end-of-chapter review questions. Dileep Mehta was Professor of International Banking & Finance, and is now Professor Emeritus of Finance, at Georgia State University.Hung-Gay Fung is Dr. Y. S. Tsiang Professor at the University of Missouri-St. Louis. His areas of research and teaching include international banking, derivatives, risk management, corporate finance, investment, and international finance, and he is currently the editor of China and World Economy. 2. Globalization of Commercial Banking. 5. Futures and Options in Currency and Interest Rate Markets. 6. Swaps and Other Derivative Instruments. 7. International Credit Function for Private Business. 9. Asset and Liability Management. Part IV: Trends and Future Directions:. 11. Toward Investment Banking Activities.